Order your own copy of Heart of the Elders at your local retailer or online through our website today! 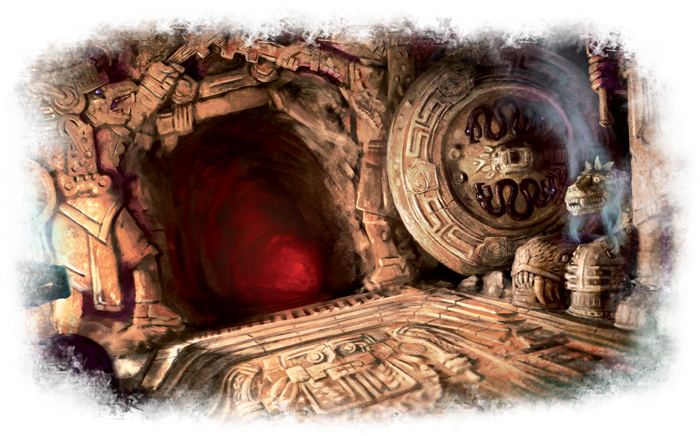 You first journeyed into the rainforests of southern Mexico in pursuit of truth. But your misguided expedition placed the entire world in danger. Now, you must return to the shadows of the forest to undo your error and restore the natural order before the sands of the hourglass run out. 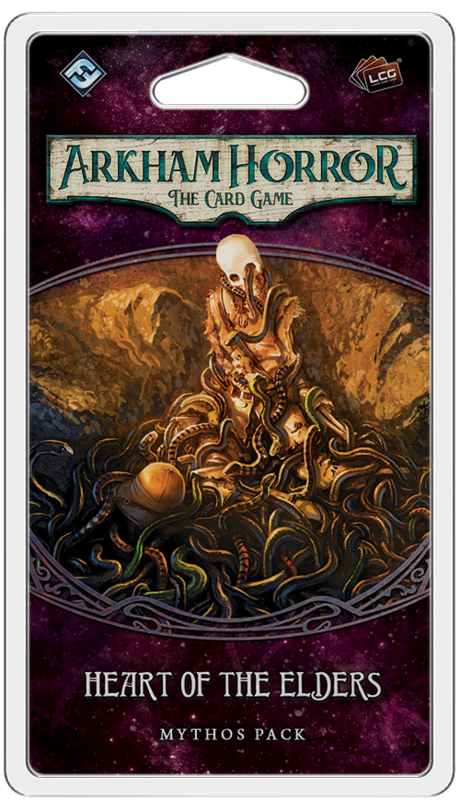 Heart of the Elders, the third Mythos Pack in The Forgotten Age cycle of Arkham Horror: The Card Game, is on sale now at your local retailer or online through our website! After your investigation in The Boundary Beyond, you and your team embark on a new expedition in the heart of the jungle. But this time, your mission is not one of discovery, but one of amendment. Your naïve mistake has placed the entire Earth in peril, and you must set it right. Now, you find yourself at the mouth of a cavern, surrounded by uncharted wilderness as the rainforest sings a maddening melody all around. Every insect’s chirp and serpent’s hiss fills you with dread, knowing that this far from civilization, one wrong step may be your last. Six pillars stand around the entrance to the cavern, each carved with a series of hieroglyphs that almost seem to morph in a strange, intricate pattern. Placing your hand on the stones causes the carving to glow, and if you twist them, the patterns shift and change. The pillars’ purpose is unclear, and the markings don’t match anything that you have seen before. Your best hope may be to search the surrounding area—perhaps there are other glyphs in the rainforest that can offer some clue to the puzzle before you. Should you solve the riddle of the pillars, your investigation will lead you beneath the shell of the Earth. 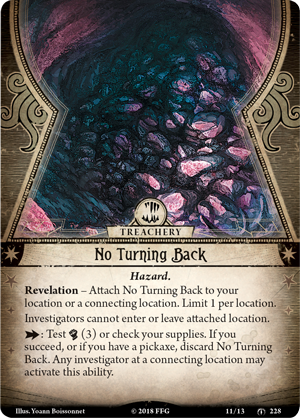 As the first Mythos Pack to feature a two-part scenario, Heart of the Elders challenges you with the opposing demands of the jungle and the cavern. Navigating the dense forest underbrush requires you to stay agile, able to evade any dangers that jump in your path. Here, even the most inconspicuous nuisance can turn hazardous, with troubles like swarming Ants! (Heart of the Elders, 221). If you're not quick enough, you may find yourself dropping valuable cards or even leaving something (or someone) behind in your struggle to escape. Meanwhile, in the ancient tunnels you may find that a simple misstep can cause a cave-in, meaning that there can be No Turning Back (Heart of the Elders, 228). But there are some dangers that haunt you regardless of where you explore. Should you encounter a Pitfall (Heart of the Elders, 215), you may attempt to jump the gap. 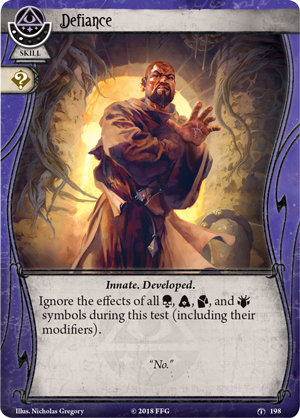 Or perhaps you will take the rare opportunity to leave this treachery for later, shuffling it into the exploration deck. 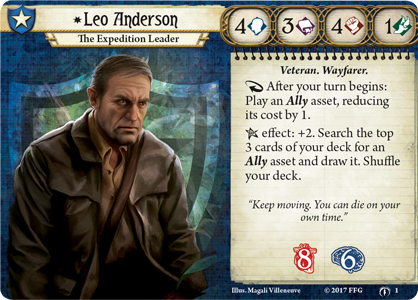 While this may be a favorable option for investigators like Leo Anderson (The Forgotten Age, 1) who are not light on their feet, leaving such a Trap for others to stumble upon is not likely to win you the affection of your fellow team members. 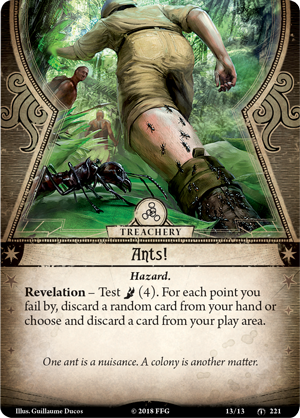 As you head deeper into the heart of the jungle, you will need to draw upon the strength within yourself if you wish to continue your expedition and see your home again. When you face unknowable terrors that push men to the brink of madness, you have no choice but to stand in Defiance (Heart of the Elders, 198) and dare any to challenge you. By using this new skill card, you can ignore the effects of all chaos tokens with scenario-specific effects! 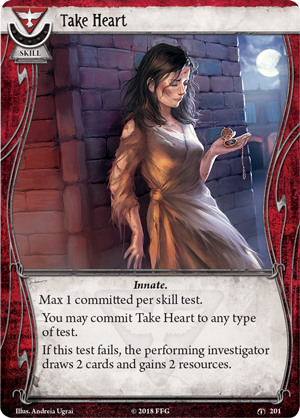 If you have the base skill level necessary to pass the test, this Defiance may give you the push you need to suceed or escape from an abrupt and tragic end. Beyond this open opposition of fate, if you have the soul of a survivor you may find the courage to Take Heart (Heart of the Elders, 201) during any type of test, whether it's a particularly difficult treachery or a fight that you cannot hope to win. 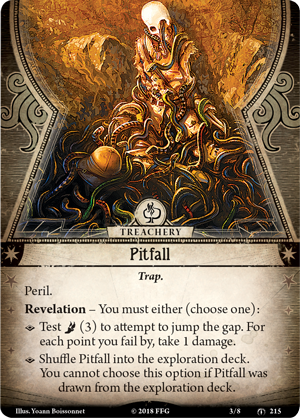 With this skill at your side, you'll draw two cards and gain two resources if your test fails, bolstering your spirits for the trials ahead. But perhaps the greatest strength that humans possess is the ability to learn from their mistakes. 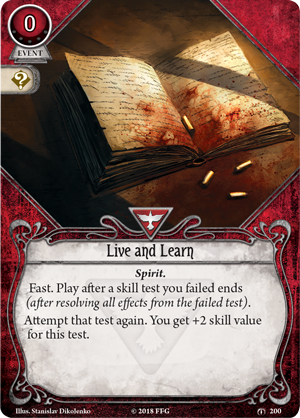 If you play Live and Learn (Heart of the Elders, 200), you can immediately attempt a failed test again, raising your skill along the way. While it may be easier to just surrender to the power of the jungle and end your mission, you have come too far to give up now. You placed Arkham and the rest of the world in the path of great peril, and only you can set it right. Accept the task before you and move forward into the unknown. The call of the jungle will not be denied—are you prepared to face the trials of Heart of the Elders? Pick up your copy of Heart of the Elders (AHC22) at your local retailer today or on the Fantasy Flight Games website here!